Pacific Coast Cutters is the professional, family-owned concrete cutting and removal company that is in high demand throughout the North Bay. Pacific Coast Cutters can give you a rough estimate over the phone for your job, or we are happy to come to your job site, place of business or home to give you a more accurate, detailed estimate for your project. From smaller jobs, like reducing trip hazards by concrete grinding and coring concrete curb for drainage to large jobs such as concrete wall openings and concrete removal, rely on Pacific Coast Cutters. Call us today to find out how our professional concrete cutting services and skilled staff can make easy work of your project. Whether your job is inside or out, we can handle it. Along with traditional gas-powered concrete saws, we also have electric, pneumatic (air powered) and hydraulic powered equipment for concrete coring, slab sawing, grinding and wall sawing. Our trucks have self-contained water tanks and generators, so we can use our own resources for every job. That also means we can provide concrete services in places other companies can�t. Our customers include engineering, general and sub contractors, business owners, homeowners, wineries, schools, city governments and specialty contractors including landscape and pool contractors. During concrete cutting and demolition, Pacific Coast Cutters pays careful attention to details such as, water, slurry and dust control. We use top-of-the-line vacuum systems to help keep job sites cleaner. We are conscience about keeping your site free of contaminents and green. Call us today for the best solution to your concrete cutting and removal needs. 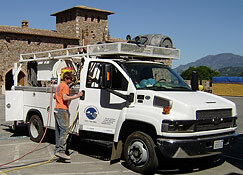 We're your North Bay specialists for professional concrete cutting services.